As FasterSkier staff stroll into an upcoming weekend with no cross-country World Cups, it’s time to scramble and score some holiday gifts for friends and loved ones. Christmas is around the corner. It’s never too late for Hanukkah (Hanukkah ended on December 10). In this third book idea for the gift-giving season, Harald Zimmer, German-based FS contributor, highlights Andre Agassi’s gem. The autobiography of a star tennis player known for weird hairdos who retired more than a decade ago? What could I gain from that if I don’t want to also become an elite tennis player, or maybe don’t even particularly care for the sport? 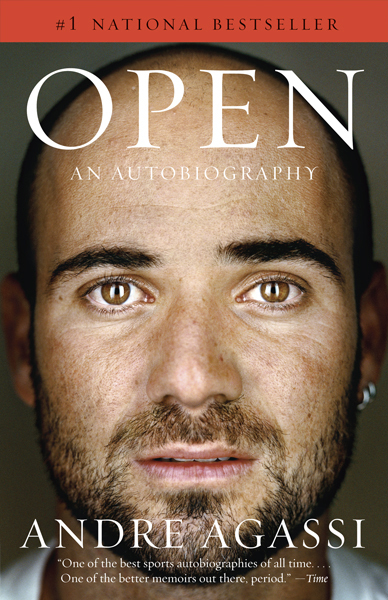 Those were my reservations as I sat down with Open: An Autobiography by Andre Agassi. Yet Agassi and this book are also among the favorite inspirations (min 31:00 in the linked podcast episode) cited by Shaun White, three-time Olympic gold medalist in halfpipe snowboarding — on the surface, a completely different athletic endeavor. According to White, both athletes dealt with “now what?“ motivational issues after experiencing success early in their careers. Success that came when both athletes were unable to think about their lives beyond their respective sports. In Open, Agassi describes in candid, vivid and at times hilarious detail how he struggled with a love-hate relationship for tennis. He expands upon his anti-climatic feelings after winning major tournaments; the win only providing brief joy. He elaborates on the disconnect between his curated “marketing public persona” and his true self, his many personal issues, and how sports enabled him to help others off the pitch and ultimately find new meaning for his own life. From the man who helped make the mullet semi-fashionable within Wimbledon’s formal grounds, Agassi allows the reader to go deep as explains how he learned to channel unpleasant but all too common events and emotions in both sports and life into the right direction and mold them into a constructive source for good. This solid read is recommended for both singularly driven athletes to the coaches, parents, and mentors tasked with helping develop emerging people under their care.